I know it's been a while and I truly apologize. I have one word to explain what's keeping me from my blog - life. However, I don't want you to think I am giving up on my blog because I wouldn't. I love it and love what it has become, and what it represents. Anyhow, I've been cooking up this blogpost in my mind for a while. Specifically, since last August, when I bought my car. The terrible experiences with the dealer in Bahrain are not subsiding and I thought I better vent off all my anger before I forget. 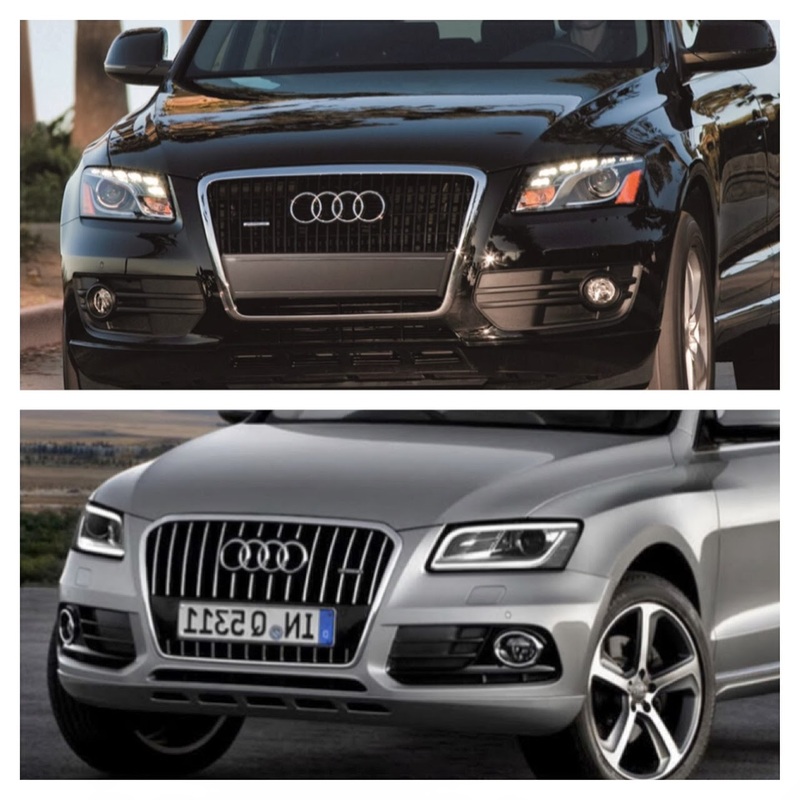 I set my eyes on the Audi Q5. Ahhh ze Germans. In August 2012, I visited the dealer here where a salesman approached me, emanating an aura of confidence and knowledge. I was convinced that this is the car for me. Once I finalized all the financing, I was good to go. Right before going through with the purchase, I asked not one but TWO salesmen if the 2013 Q5 coming out in a few months would have any cosmetic changes, facelift...etc. They both guaranteed me one thousand percent that the only difference would be the production date. In other words, nothing. They told me "Go for it! It makes no difference if you wait because it's the same car." And on that note I did. And guess what - they did change it. The lights are different and some interior options have also changed. Great start of a relationship. Top is my make, bottom is the 2013 model. No difference at all Mr. Salesman! No difference at all. Fast forward to the first service. I had two issues with the car: the wiper fluid was shooting off the windscreen and my side-view mirror needed to be touched up. To both issues my service adviser said they could be fixed. I pick up my car, and being the attention freak that I am, I dissected the check list sheet I was given before driving away. The check list had a number of items that were either OKd, or if they had an issue they would be checked and then another check would be ticked if the issue was rectified. Everything was either OK or rectified except for one issue - the tires. When I asked the service adviser he said "It's probably something they forgot to check. I checked your car myself, it's good to go." I reach my car and I check the wiper fluid, still not rectified, the mirror, still not fixed, and guess what - a huge nail is shoved deep in the rear wheel. An angry walk back to the dealer I went straight to the service manager and asked him to follow me. Fortunately, I didn't have to say much and he was very understanding. He arranged for a replacement car and told me the car will be ready by tomorrow. I won't bore you with more details, but needless to say, my disappointment was sky high, my annoyance was at maximum, and my anger at the useless and careless sales adviser was evident - I immediately asked the service manager to change him to someone else on the system. Fast forward to my second service, a little over a month ago. Since my rear view mirror was never fixed, I pinpointed it this time. I was very clear: please let me know if it can be fixed. The newly assigned service adviser said she would, and as promised - she called saying it can be touched up and it'll take an extra day at the body shop. So I am carless for 2 days but it's OK. They said it can be fixed so it will. I pick up my car 2 days later, and the touch up is basically the smudge of a 3-year old. Not only was the touch up terrible, but the color was off! I walk back angrily (dejavu) and the service manager just walks out of his office, knowing that something went wrong - again. When he sees the smudge I see his face turn 5 shades of red. He begins to explain that touch ups are usually not perfect and will be off, but this should have never left the workshop. And yes the color is off. I am not unreasonable and will not demand the impossible. But when the service manager at the dealer agrees with all my points without putting up a fight - it really makes me wonder how careless staff is in general. They had to keep my car another day and repainted the entire side mirror, at no cost to me. That dealer is a sinking ship, and this service manager is trying his damnest best to patch things up. But honestly, I don't know how long it will take until this dealer starts to match its competitors. For being the agents to such a beautiful brand, they have massacred it. I love my car, but I hate the dealer. I got a call a few weeks later from their customer service HQ in Dubai and I gave the call agent an earful of experiences. Not sure where that will go. And not sure if this will spark anything honestly. But I figured I would give it a shot. Same is the Mercedes dealer; All are same it seems.